Decal #48-745. 1/48 scale. 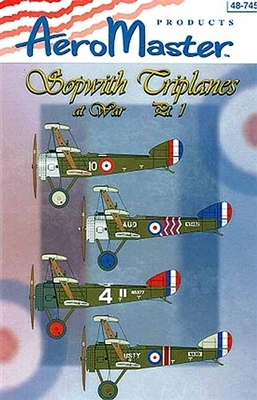 Includes markings and stencils for FOUR different Sopwith Triplane aircraft. Centre d'Aviation Maritime, Dunkirk, April 1917; 8 Naval Squadron, St. Eloi, France, May-August 1917; 1 Naval Squadron, Baillul, France, October 1917; and 8 Naval Squadron, St. Eloi, France, May 1917.